Juice cleansing can be a great way to restore good health, lose weight, give yourself more energy and cleanse your body of toxins. Learn how to do it right. Juice fasting, also known as juice cleansing, has been practiced for thousands of years. It is not only a great way to lose weight but also a way to detoxify the body, help improve your skin, solve problems with health disorders and so much more. But what is juice cleansing? It means that you don't eat or drink anything other than juices or water. The juices can be made of a wide variety of fruits and vegetables, thus helping ensure you receive all the nutrients you need on a daily basis. This liquid diet can be followed for only a few days, a week or two, a month or even longer. Detoxification. The good, healthy things that you get from veggies and fruits are concentration in a juice diet. That means the detoxification properties, including the antioxidants that cancel out the free radicals in your body, have a chance to really work with your immune system and improve your health. Skin health. The anti-aging effects of juice cleansing show up in your skin and hair. Your skin will be smoother and clearer, while your hair will be fuller and shiny. These are all signs of a healthy immune system. Addiction Withdrawal Symptoms. A juice fast can help your body overcome the nasty addiction withdrawal symptoms of drugs, alcohol, caffeine, nicotine and more. If you are trying to stop any of these bad habits, be sure to incorporate a juice cleansing into your plan. Health Disorders. Many health disorders can benefit from juice fasting. Those with bulimia, problems with digestive health, and other health issues can turn to it for a healthy way to "reset" their system and become healthier. Weight Loss. This is one of the most common reasons why individuals choose to go on a juice fast. As the juice cleansing cuts down on the fat your body takes in, it is forced to burn the residual fat, and that helps you lose weight. A juice cleansing can also stimulate your metabolism. When you are juice cleansing for weight loss, keep in mind that you can still get the good nutrients you need by juicing all types of fruits and veggies, including leafy greens and fresh grasses. There are side effects to every type of diet. 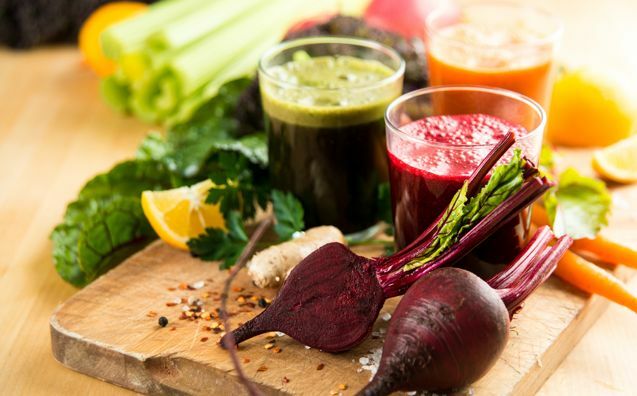 The side effects of juice cleansing or fasting might include hunger, especially during the first few days or weeks, changes in blood sugar levels and the occasional feeling of being light-headed. If your juices contain tomatoes and oranges, acid levels in the body could rise, leading to acid reflux. You might also suffer from constipation, since your body could be lacking in the fiber it needs from a regular diet. Remember to ask your doctor before starting a juice diet, as the diet might interfere with certain medications or treatments. There are numerous types of juice cleansing and plenty of recipes to try with each. Keep in mind that your diet plan should only be used for a short period of time. 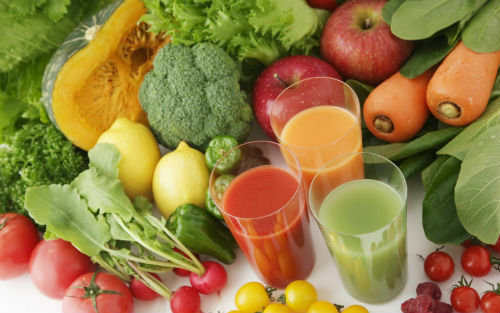 The following types of juice cleansing can be used to create a juice diet that suits you. Fruit Juices. These can include any fruits that strike your fancy, including cherries, blueberries, blackberries, strawberries, grapes, lemons and even apples. Vegetables Juices. These include all the things that are good for you, like tomatoes, cucumbers, leafy greens, parsley, spinach and more. Root Juices. These include anything that comes from the earth, such as sweet potatoes, peanuts, carrots, onions, yucca root, turmeric root and the like. There are many excellent recipes out there for juice fasting. Here are a few that work well. Apple and Celery. Wash, cut and core two apples. Add two stalks of celery. Juice the ingredients, and then add a dash of lemon juice to the drink. Watermelon and Cucumber. Cube up a cup of watermelon and a half-cup of cucumber. Juice them together. Tomato and Red Pepper. This consists of two medium tomatoes and half of a red bell pepper. It's important to drink this juice immediately for the best flavor. Pineapple and Mint. This refreshing drink is made of two cups of pineapple chunks and a handful of mint leaves to taste. When you are juice fasting, it is important to plan out every meal so that you know that you are getting the best nutrients possible. Here is a sample diet plan to get you started. Breakfast. You can have one liter at this point in the day. Make it a "master cleanse" juice, or fruit juices blended together. You can dilute this with plenty of water. Lunch. Now it's time to get your veggies! You should have about 350 mL, or almost two cups. Vegetable juices are the best thing to have for lunch, to help ensure you get the right amount of nutrients. Dinner. Choose something heartier this time, like a thick broth. It's okay to have enough to fill you up. Snacks. If you aren't getting enough in the meals, you can have snacks. Try to stick to wheatgrass, beet juice or carrot, because they tend to be more filling. Please keep in mind that if you have any medical conditions or health problems, talk with your doctor before you begin a diet like this. You might need to modify it in some way in order to stay on the diet for longer than a day or so.